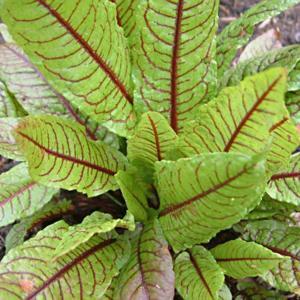 Tap rooted perennial forming rosettes of conspicuously red-veined, lance shaped leaves. Erect stems of small star-shaped flowers in summer, pale green at first maturing to reddish-brown. May not flower in cool climates. Moist, reasonably well drained and fertile soil in sun or part shade. Flower stems can be removed to encourage foliage growth. By seed or division. May self seed freely in favourable conditions, even becoming invasive. The young leaves are edible, similar to spinach.